All too often our best intentions of preparing our homes for the winter season just don’t happen and we don’t manage to prepare the outside of our home, especially our roofs in time for winter. Despite that possibility, one can still keep his or her Des Moines roofing in good shape. Keeping the roof in good condition may take some work during the icy season, but it is doable. Inspect the gutter systems to make sure they are not clogged with branches, leaves or other debris. 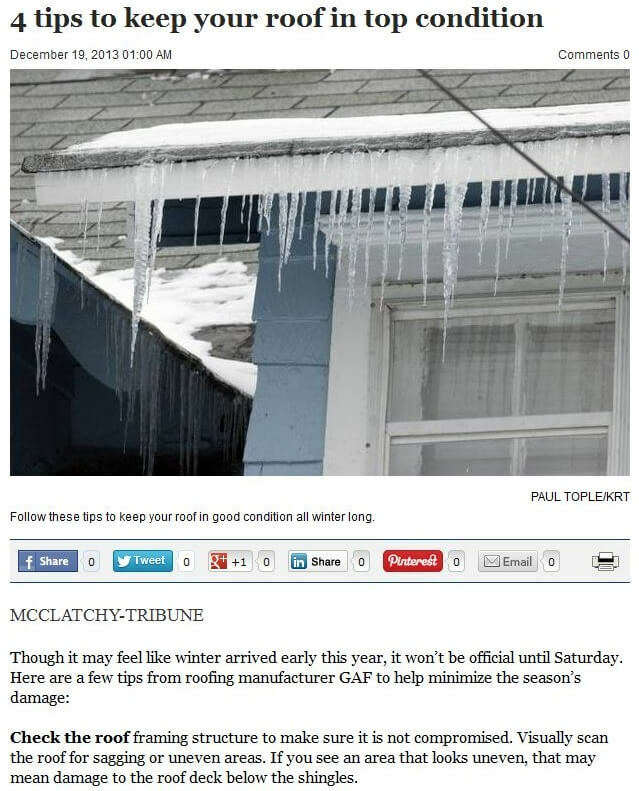 This is important to ensure that rainwater and snow have a way off. Make sure gutters are fastened properly and are secure, so they don’t cause overflow and build-up, or fall off the fascia board. Check the valleys of the roof to ensure they are clear of debris that can add weight and act as a barrier to rain and snow. Granted, not everyone feels inclined to check the roofs outside with all the damp cold weather. One has to set a ladder in place, climb up (and hope all goes well), and inspect the rooftop. If one has a pair of binoculars, though, he or she can use it to zoom in on the roof and look for broken gutters or loose shingles. It is after all, the rainy season here. On the other hand, checking the roofs from the outside is not the only option. Another alternative is to conduct the visual inspection from the inside of the home, specifically the attic or any other portion of the home that the roof sets directly on. One danger with this approach is that by the time you see damage in your home in the form of stained ceiling or bubbling paint, there is already damage to the roof that should be addressed. When checking the roofs from the attics, look for signs such as water leaks and structure problems. Water dripping on the floor or condensing at the ceiling indicate it has gone through the roof shingles. An example of a structure problem is a sagging roof, a sign of weakness at the structure that might give way anytime. The tips above only apply to relatively simple problems on the roof. Everyone ought to seek professional help for more complex issues. One professional such as Tedrick’s Roofing can assist with a more detailed inspection or roof repair in Des Moines.